As one of the founders of Royal Pacific Realty Group, Sing’s role has been to create and implement long term business development. He has built Royal Pacific Realty into an internationally recognized residential and commercial real estate firm with more than 1,100 licensed REALTORS® in four offices, who together sold $9.2 billion worth of real estate in 2014. Following the merger of his company to form Royal Pacific Realty in 1995, Sing and General Manager Andrew Peck expanded the company by acquiring Keystone Realty, Cathay Realty, International Pacific Realty, and Homelife Habitat Realty, creating a team of 650 professional REALTORS® in 2004. In 2005, Sing negotiated the acquisition of New World Realty as a wholly owned subsidiary of Royal Pacific Realty, making Royal Pacific Realty Group the largest privately owned real estate firm in Western Canada. Sing’s primary role is as strategic advisor, mentor and coach. Sing also devotes time and energy to volunteer work, serving on many boards and committees, raising funds for local and international communities. 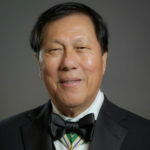 He is a long-standing director and Past President of the Westside Division of the Real Estate Board of Greater Vancouver. Sing and his wife Patricia devote time through advisory roles and donations to many charitable causes. Recipients of their generosity include BC Children’s Hospital, Canuck Place, Tapestry Foundation for Healthcare, Mount St. Joseph Hospital, the REALTORS® Care Endowment Fund and Blanket Drive, S.U.C.C.E.S.S., Malaysia Singapore & Brunei Cultural Association, the Heart and Stoke Foundation, and the ASEAN Golf Tournament. In 2002, Sing and Patricia developed a philanthropic vision for REALTORS® to leave a legacy in British Columbia. In 2003 this resulted in the establishment of the BC Children’s Hospital REALTORS® Care Endowment fund. To date, more the half a million dollars has been raised. As a result of Sing’s persistent promoting and lobbying, the REALTORS®’ Care brand went national and in 2006 the Canadian Realtors Care Foundation was launched. Sing is currently a director and a driving force behind this outstanding achievement.